Alzheimer's Disease in India: Multiple uses of physiotherapy useful in Old Age. Multiple uses of physiotherapy useful in Old Age and in cases of physical and cognitive impairment conditions. All therapies that aims to develop someone's body really helps a lot. 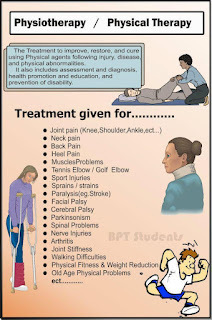 Physiotherapy is one of the most helpful therapies that a person can ever attain. Thanks for this helpful blog. Our dementia and memory clinic in Toronto provides the tools necessary to deal with the many phases of memory impairment, from prevention, enhancing quality of life and planning for the future.